New York City Mayor Bill de Blasio (D.) walked away from a homeless woman while she asked him for greater public assistance Friday. A video of the encounter, posted to YouTube and detailed by the New York Times, shows de Blasio shaking the woman’s hand in a Brooklyn Y.M.C.A. She asks him, "Out of 300,000 units in your affordable housing program, only 5 percent will go to the homeless. Can you look me in the eye and tell me why?" De Blasio interrupts her. "I’m in the middle of doing my workout," he cuts in. "Sorry. I can’t do this now." His security details steps in and he departs. 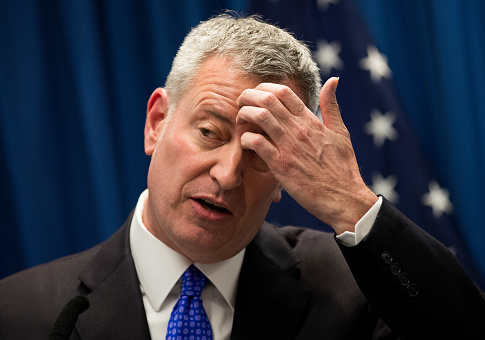 De Blasio later agreed to meet in City Hall. De Blasio’s press secretary, Eric Phillips, blamed the homeless woman for interrupting the mayor's gym routine. "People working out at the gym shouldn’t be worried they will be recorded in highly publicized, videotaped political confrontations every morning," Phillips said. The woman who approached de Blasio is Nathylin Flowers Adesegun, a 72-year-old who lost her home and has advocated for New York public assistance for the homeless. She is a member of Vocal-NY, which has tried without success to move de Blasio on the issue. De Blasio has ignored the group, according to members. "We needed to get his attention or he was just going to keep blowing us off," Adesegun told the Times. Members of Vocal-NY have called into de Blasio’s radio appearances, attended his town halls, and participated in agency meetings, but without success. Giselle Routhier, policy director of the Vocal-NY, blamed de Blasio for over a year of inaction since the group first began calling on him to act. "You can’t address record homeless without dedicating a meaningful portion of your housing plan to homelessness," she told the Times. De Blasio’s office stood by his refusal to engage Adesegun. "It’s not the right venue for these discussions and the mayor won’t have them there," his press secretary said. Over the course of his almost five years in office, Mr. de Blasio has been confronted at the Y.M.C.A. by the union representing uniformed police officers as well as by a large group calling for traffic-calming measures after the deaths of a 4-year-old girl and a 1-year-old boy who were struck by a driver a block from the gym. On average, the mayor encounters at least one protest per month at the gym, and, as he did with the group calling for traffic changes, Mr. de Blasio sometimes stops to talk. Under de Blasio, the homeless rate in New York City has reached its highest since the Great Depression. More than 60,000 of the city’s residents, a third of whom are children, live in shelters.